The very idea that any waterbird, let alone such an interesting and highly-sought species as the Black-bellied Whistling-Duck, might be more common and easily found in the arid Valley of the Sun than in seemingly more hospitable parts of Arizona, provides a pleasant surprise to birders new in the Phoenix area. After all, the Black-bellied is so persistently arboreal as to put the "tree" in Tree Duck, a truth well known to every birder, and would seem to be much more at home in wooded tropical lowlands from the tree-lined resacas of south Texas and the great mangrove swamps of western Mexico south to central Argentina. How, then, does it happen that such a bird has established a large and growing population in central Arizona? In fact, our local population is a rather recent event. Birders began to report small numbers of Black-bellies near Phoenix in about 1970, and since then the numbers have steadily increased. Now flocks of 30 to 50 individuals are regularly reported, especially in fall, and some winter flocks have included well over 100 birds. This doesn't hold a candle to the huge flocks seen in Mexico, of course, but seems like a lot for a desert region that largely lacks preferred habitat. There are marginal habitats available, in the form of man-made ponds with nearby agricultural fields. There aren't many suitable nesting trees in our valley, but the Black-belly is flexible in this regard. 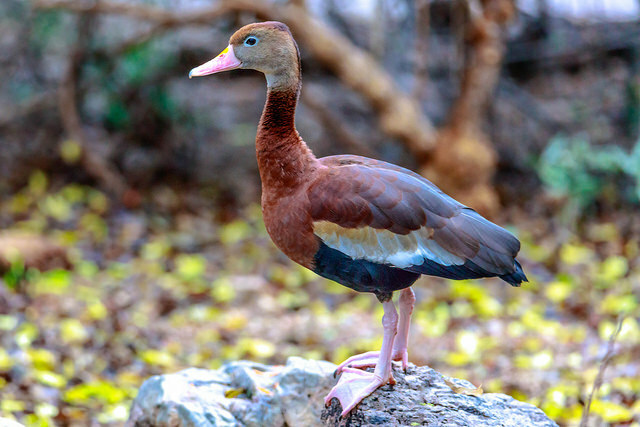 No one seems to know for sure where those original few pioneer birds came from; but Whistling-ducks of all eight species are popular captives and they may have been escapees. On the other hand, Black-bellies have been known to occur in southern Arizona since well before the turn of the century, so a natural source may be equally likely. Whatever the origin of the few pioneers may have been, the population is firmly established around Phoenix and seems to be growing. Some of the increase may be due to recruitment from other populations, but Black-bellies also nest locally - a measure of their adaptability. Studies in Texas have shown that Black-bellies prefer to nest in closed tree cavities, but where these are unavailable, they also employ the open cavities formed in the stubs where branches have broken off. They also enthusiastically take to nest boxes placed for their use, and in one experiment occupied more than 80% of over 600 such boxes - a very high rate, even when compared to the Wood Duck. Where there are no trees or nest boxes, Black-bellies will nest on the ground, usually placing a small cup, well-woven of grasses, under a shrub. Presumably, broods of downy young seen in the largely treeless Gilbert Wildlife Sanctuary came from just such ground nests. Recently, mainly thanks to the Maricopa Audubon Chapter, a number of suitable boxes have been located around the Gilbert Wildlife Sanctuary ponds, and we can look forward to increased nesting success when the Black-bellies begin to use them. Black-bellies are gregarious birds, nesting in loose colonies and congregating in flocks outside the breeding season. Males and females form durable, even lifelong, pair bonds in their first year and may remain mated throughout the year, though this is often hard to detect in the autumn flocks of similarly-plumaged birds. Both parents take turns incubating the 9 to 18 eggs for the necessary 27 days, and both parents rear the downies for the next eight weeks until they fledge. Broods travel in goose fashion, with one adult leading the single file string of downies and the other serving as "rearguard" and file-chaser. Fledged juveniles wear a drab, largely gray and brown plumage at first, but continue to molt until at about age 16 to 20 weeks they become virtually indistinguishable from adults, with their long pink legs, rusty neck and chest with black belly, bright coral red bill and a broad white patch along the forewing. The Black-belly is the Valley's only common representative of the small (eight species) but widespread group formerly known as Tree Ducks. They don't all need trees, and a couple of species never go anywhere near them, so now we call them "Whistling-Ducks". Whistling-Ducks are so similar to each other and so unlike other waterfowl that they are unknown to hybridize with other waterfowl, though they will rarely hybridize with each other in captivity. For these reasons, taxonomists have grouped all the whistling-ducks together in the same genus: Dendrocygna; the Black-belly thus becomes the "Tree-swan of autumn", or Dendrocygna Autumnalis, doubtless a reference to its proclivity for foraging in agricultural fields at harvest time. This much is straightforward; but where the whistling-ducks fit into the great taxonomic scheme of things is more problematic. They are somewhat ducklike, somewhat gooselike, yet have some characteristics unlike any other waterfowl. Current wisdom, embraced by the AOU Checklist Committee, groups the whistling-ducks with all the other waterfowl, a little closer to geese and swans than to the true ducks, but perhaps forming some kind of linkage between these two great groups of waterfowl. However, recent studies on avian DNA lead to quite a different conclusion. Using a technique known as DNA-DNA hybridization, which measures similarities and differences between the DNA's of different organisms, Charles Sibley and Jon Ahlquist have found that the whistling-ducks have such different DNA from that of other waterfowl that they deserve not only their own genus, but actually belong in their own family. They are still the closest relatives of the true ducks, geese, and swans, but according to Sibley and Ahlquist's admittedly speculative timetable, the two lines diverged some 40 to 45 million years ago. No wonder they don't hybridize. Phoenix area birders have ample opportunity to observe these fascinating birds for themselves and to draw their own conclusions. Black-bellies are resident in the Valley and can be found at all seasons. The most reliable location has been the Gilbert Wildlife Sanctuary, located east of Cooper Road and between Guadalupe and Elliot Roads; watch here especially for family groups anytime from June through August. Often, Black-bellies occur on the ponds in and near the Phoenix Zoo in Papago Park; the Zoo doesn't have any Black-bellies in their collection, so any you find there should be free-flying. The Sun Lakes Reclamation Ponds on the north side of Riggs Road usually provide Black-bellies. In the northwest Valley, the pond located on the west side of El Mirage Road, about a mile South of Lower Buckeye Road, is a fairly reliable spot. Don't confine your observations to these few locations though, because Black-bellies have probably occurred on just about every park lake, sewage lagoon, and golf course pond in the Valley at one time or another. You may have to hunt a bit harder for them in winter, not because they are fewer in number, but because they concentrate in a few large flocks at favored locations; these communal roosts change from year to year depending on variations in environmental conditions. The most recent such roost was used continuously through the winter of 1995-6. This roost is at the farm pond near the intersection of McQueen and Queen Creek Roads, adjacent to the Chandler Airport, where numbers consistently exceeded one-hundred.